It is humbling and fulfilling, as a Tarot Reader, to come to you highly recommended by my clients overseas and in New Zealand. Feel free to check out what clients say. You can also click the TripAdvisor widget on the sidebar for more client feedback. Thank you again for reading at our function. The general feedback I’ve received from guests and colleagues is that your presence there was very nice. Most guests found it very interesting and liked that you managed to fit in a lot of readings in the space of 2 hours. I did give out the address of your shop to a lot of guests, so hopefully, they will turn up for a more in-depth reading soon! The only difficulty was the lack of quiet and that’s is not your fault at all. I didn’t realise the music would be so loud. Please accept my apologies for that. Book Zamm for a Group Tarot Reading at your event. We all really enjoyed having you and everybody had positive feedback from their experience with you. Sorry, we got the timing wrong and it was great you managed to come when you did! Booking the event and corresponding with you was very easy and we all thought you presented yourself very well! I would definitely recommend you to others! Many thanks, Lucy C.
From start to finish Zamm was a delight to work with, easily contactable and readily provided any extra information I needed. For such a low maintenance addition to our party, the tarot reading was such a success – guests have been telling us they really enjoyed their readings and that ‘she really GOT me’ (as one person put it). The whole thing was seamless and easy, and Zamm worked tirelessly through many readings for 4 hours! The mystery and novelty of having Tarot card readings available for our guests really helped the party succeed – it was a great talking point throughout the night. Thanks again! Kelly R.
Zamm was a highlight of our themed client party! Not only was she friendly and engaging but she was also very professional. She was sure to make our guests feel at ease about the reading and converted some sceptics. She presented herself with flair and the wig was perfect for our Alice and Wonderland theme! Finally, Zamm made the planning process very smooth as she was super responsive and easy to get in touch with. Charlotta C.
Zamm was such a hit at the party last year that we absolutely had to have her back again this year, and she did not disappoint! Everybody was super excited about their readings and her presence definitely a highlight of the evening. As for our communications with her, she was quick, responsive and extremely accommodating, which is greatly appreciated. Thanks again for a wonderful evening, Zamm! Juliana S.
Tarot Zamm was so easy to deal with. Booking was no problem at all. The whole event went really well and everyone loved it. She was flexible in how the readings were completed. She was lovely for the whole time and everyone came away feeling amazing about it. The bride-to-be was blown away by the (scary) accuracy of the readings too, and loved listening to Zamm read the tarot cards for all her close friends. Would definitely recommend to anyone, and have already. ~TK19L, Wellington, N.Z. I’ve been hearing those readings and they give me some peace knowing that there are better times ahead. To be honest, I have been feeling like stuck in the middle of ocean without any support and there is no point in crying also for no one is there to do a thing and then suddenly you come with a life vest for rescue. This journey is hard, very hard, ….. but it’s best to accept the situation with grace and dignity. No words can thank you for your compassion your guidance and support. Ma’am people come to you with grievances and misery and leave your room with a ray of hope. I’m sure angels rejoice every time you help lost souls find their way. Thank you for being there and for doing this for all of us. I would like to say that your reading was absolutely fantastic and so true and spot on, exactly what I needed to know at the time and what helped me with my transformation. Click here to book a Tarot reading with Zamm. Thank you very much for the reading you did for Natasha and I. It was an amazing and eye opening experience. I have nothing but positive feedback for you. I was apprehensive at first because I have only recently been exposed to the Tarot. It is largely unknown to me and I think that that uncertainty created a measure of anxiety for me. But I was willing to be open to it and prepared to treat it seriously and with respect. I’m very happy that I did. Your initial words reassured me that things were not set in stone and that free will is an important concept to remember when engaging with the cards. I was constantly surprised at how I could relate to the information you were providing us with and I was impressed at the speed and level of intuition that was being articulated. The open reading immediately touched on issues that we were dealing with in our personal lives, which I find incredible. Specific things were mentioned that echoed almost exactly some things that Natasha and I had discussed earlier. This affirmed for me that we were on a positive path. I was looking for direction and answers, and it seems like we asked some of the right questions because what you were channelling resonated deeply with me, and I am sure for Natasha as well. I was so impressed and touched by what you told us, that I have recommended you to friends and family who I think will be receptive to it. I had never had a reading done for me before but had been feeling very anxious about a lot of things in life so thought I would give it a go. After the reading everything she said had something to do with the things I felt I needed answers to or guidance. I feel much more at peace and calm than I have in a while. Definitely recommend and I will definitely visit again when I am in need of guidance. ~D.H., Wellington, N.Z. I visited Zamm as there were a few issues in my life that I needed some insight to. Zamm picked them up easily and gave me feedback about what was really going on so that I could gain a better overview of my life right now. I can’t know whether everything she said is accurate, only time can tell me that, but it was intuitive and on that level I know its wise to listen to her and keep her insights in mind as I go through this period. Have recommended her to my bestie and will be visiting again. ~P.S., Wellington, N.Z. I am local to Wellington and I have visit Tarot Zamm on quite a few occasions. I find that each time I have been to get guidance, the reading is very accurate and reflects what is going on in my life at that time. I will not go back to any other tarot reader but Zamm. ~R.J., Wellington, N.Z. I’ve had other readings before but found Zamm was so insightful & really comfortable. Highly recommend (if possible) for you to do a “face to face” reading as I felt this made the experience more meaningful, I’ve had phone readings with Zamm also and these were always good too but definitely prefer the face to face experience. There are many different tarot readers out there and I have been to a few or actualy many throughout the years but I tend to only come back to Zamm now. Not only is she accurate, very helpful but also a very sympathetic person. She emphasizes what is really important to think about or not to forget as she is presented with things from the cards. She listens to you and you feel comfortable and will receive great insight. I’ve been to many different Tarot readers down through the years and can’t recommend Zamm enough. I felt very comfortable in her company straight away and found her readings to be both extremely accurate and helpful. For some things she reminded me of what I needed to hear and reaffirm in my life, and for others, she offered clear insight into my choices and options. Overall it was an amazingly positive and comforting experience and one which I’ll keep with me for a long time. 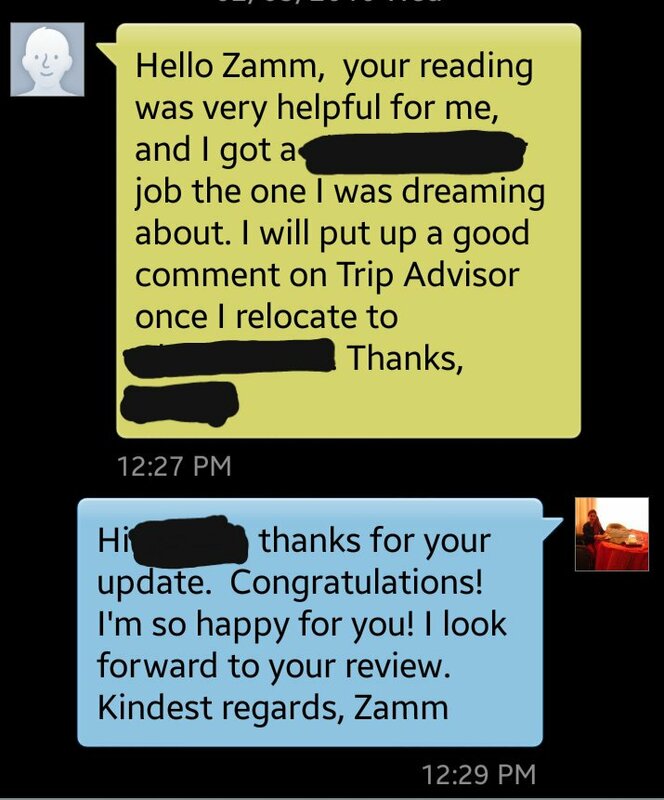 I’d have no hesitation in recommending Zamm for a an honest, rewarding and positive experience. ~A.M., Wellington, N.Z. I was very pleased with the reading I received from Zamm because she showed me the options I could pursue in regards to my question and the outcomes that will follow. I love that she emphasized the importance of our agency and free will when it comes to the possibilities and paths life unfolds before us. Ultimately, the choice is always ours. I also liked that Zamm focused on positive things. I was never much into Tarot but I did a session because I received a recommendation from a good friend of mine. We both were not disappointed. My experience was very comfortable and helped confirm my thoughts. The session helped create an insightful pathway to help re-think and organise current and future actions. Thank you for your insightfulness Zamm! I’ve had quite a few readings over the years, but my reading with Zamm blew me away. She was so accurate, even down to the words she used to describe my situation, that she could have been plucking them directly from my thoughts. I could not recommend her enough, and I am sure I will be back for future guidance. ~J. L., Wellington, N.Z. Ive been on tarot Zamm searching for some guidance and I was really impressed how accurate she was. She gave me details of my life, that i was trying to hide from myself. My consultation was very helpful. Thank you very much. ~ Goldengirl288, Wellington, N.Z. I messaged Tarot Zamm one morning in a bit of a desperate attemtp to find some clarity. She was able to sort out a reading for me straight away, and was very accurate and helpful. I’ve had my cards read before and study the tarot myself, but I felt I needed some outside guidance. I will definitely go to her again; I did my reading over Skype and it didn’t diminish the experience at all. I will definitely try to book one in person when I have more time to schedule one! She was very accurate without being vague, and provided guidance for more than one scenario/outcome. I received an amazing reading from Tarot Zamm. I opted for the “open reading” and what came up was so accurate, I had goosebumps as I listened to Zamm. I have been stuck for so long, waiting for clarity to hit me, and then I got this reading and a wave of clarity washed over me. I’ve kind of known it in my heart but resisted the message from my inner guidance. Hearing it from Zamm, together with her divinely inspired guidance, helped me greatly in receiving, acknowledging and accepting the message. Zamm was able to sense my energy and really cut to the core of what was holding me back. Zamm is highly intuitive and I will definitely recommend her to anyone who wants guidance from a higher source and/or simply wants to release negative energy. Wow!! everything you said was true! !… meeting you wasn’t a coincidence!! ever since I started to write my dreams last year amazing things manifest in front of my eyes, sometimes when I see it I feel like I was going to lose my mind in such way of precision. you got it right in the spread! I am torn by two choices!.. but know I see it clearly thanks to you.